Birmingham, AL – For 7A football powers made High School Football America’s National Top 100 rankings this week. The Thompson Warriors made their first appearance in the national rankings following their upset of the Hoover Bucs who fell 41 spots to No. 71. Check out how each team made their way in to the Top 100 and look ahead at what remains for each squad. Hewitt-Trussville became the highest ranked in-state team in the HSFB Top 100 this week following their 44-13 drubbing of the James Clemens Jets (3-6) Friday night in Madison. 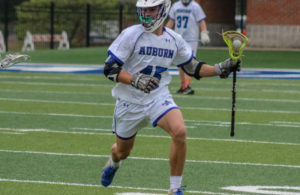 The win gave the Huskies their second consecutive 7A region 4 title while moving Josh Floyd’s squad within one victory of completing their second consecutive undefeated regular season. Hewitt has amassed a staggering 435 points while giving up only 120 through nine games. After their final regular season game this Friday night against the 6A Florence Falcons the Huskies are slated to host the Spain Park Jaguars in the first round of the AHSAA 7A playoffs. Beating the Jags could set up a huge second round showdown with the Hoover Bucs, a team the Huskies haven’t beaten since 1997. The Central Red Devils dropped two spots in this weeks rankings from No. 61 to 63rd following their 56-20 victory over the Prattville Lions at Garrett-Harrison Stadium. Central’s road to their fourth straight region championship was highlighted by wins over Auburn, Lee-Montgomery, Jeff Davis and Opelika. The Devils, ranked No. 1 in the Alabama Sports Writers Association 7A Top Ten have this Friday off before playing host to the Foley Lions or Theodore Bobcats in week 1 of the 7A state playoffs. Hoover made the biggest drop in this week’s top 100 sliding 41 spots from 30th to No. 71 nationally. The slip followed the Bucs loss to the potent Thompson Warriors. The loss marked the first time the Warriors have beaten Hoover since the series began in 1988. Josh Niblett’s Bucs road to the end of the regular season doesn’t get any easier this Friday as Hoover hosts Florida’s IMG Academy at the Hoover Met. The 6-0 IMG Ascenders come to Hoover ranked 2nd nationally in this week’s HSFA Top 100. 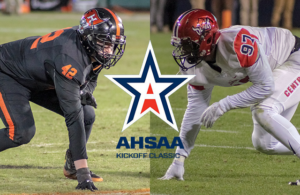 After taking on the Florida powerhouse, Hoover will kickoff the post season at home against the 7-2 Sparkman Senators. 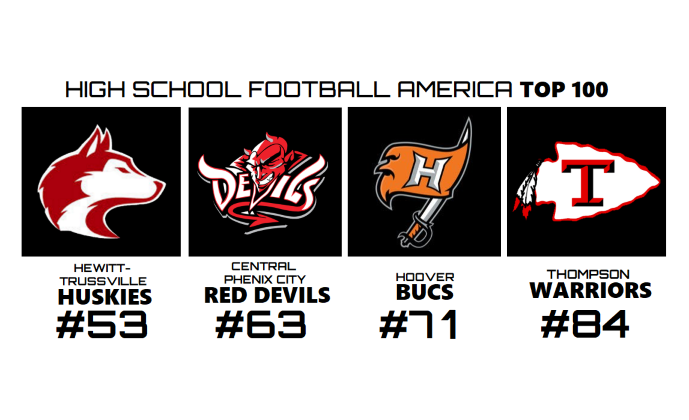 Head Coach Mark Freeman’s Thompson Warriors made their first appearance in the HSFB Top 100 this week following the program’s first win over powerhouse Hoover Friday night. 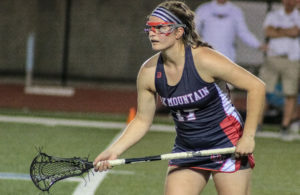 The win marked the Warriors first win over the Bucs in program history and their first region championship since 1997. Currently ranked third in the Alabama Sports Writers Association 7A Top 10, Thompson has rattled off blowout wins over Mtn. Brook, Spain Park, Vestavia Hills and Pelham in addition to their historic victory at Hoover. A win Friday night over 6A Hillcrest-Tuscaloosa (7-2) will give their Warriors their second undefeated regular season in program history. Thompson will begin their playoff march toward the program’s second AHSAA state championship November 10th at Larry Simmons Stadium against the 5-4 Huntsville Panthers.